Ghent's new enclosed tackboards feature a recycled rubber surface that makes doing the right thing easy to do — for you and for the environment! Made from 90% post-consumer recycled materials, these boards are sure to pass any "green" standard set by schools, instructors, and parents. The textured, black, tackable surface is self-healing and won't show pinholes. Plus, it wipes clean, and is fade-resistant and stain-resistant. Lockable, hinged doors and shatter-resistant acrylic faces assure security and safety. The overall depth of each unit is 2-1/4" (6 cm). 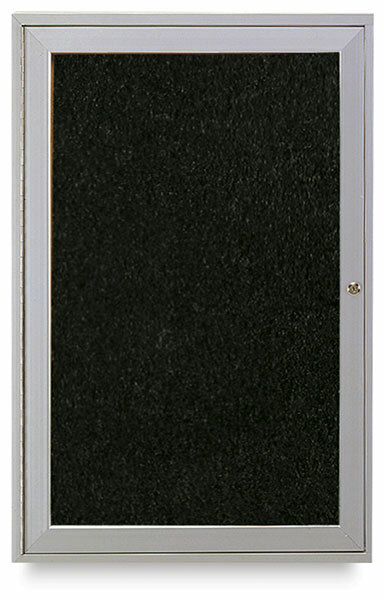 The space between the glass face and rubber tackboard is 1-5/16" (3 cm). 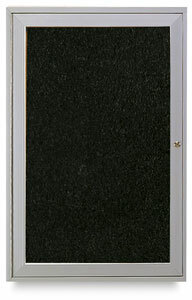 Ghent Recycled Rubber Tackboards feature a 10-year manufacturer's guarantee.